waffle recipes. waffle iron recipes. The Waffle Iron is a unique appliance in which batter is cooked between two special, chequered plates, thereby producing waffles with the same chequered pattern embossed on them. This makes the waffle visually appealing and also gives it a special texture and a rich aroma that is comparable to baked desserts. This device can be used to make soft waffles for breakfast or dessert, as well as crisp waffles in which ice-creams are served. Waffle maker can be of various shapes like square, round, heart etc. Authentic waffle batter is made using eggs. Enjoy the waffles warm and fresh with a drizzle of maple syrup or freshly sliced fruits like mangoes or strawberries. You can serve them along with whipped cream or ice-cream. Waffles may be savoury, like the Green Pea Waffle or the Cheesy Corn Rava Waffle, or they can be sweet like Waffles with Butter and Honey, which tastes awesome with whipped cream and chocolate sauce! Kick-start your morning with nutritious Moong Dal Waffles with Stir-fried Vegetables and serve with a glass of Melon and Black Grape Juice to make it a wholesome breakfast. Also, you can make Chick Pea and Mint Waffle that is chock-full of fibre, vitamin A and protein. 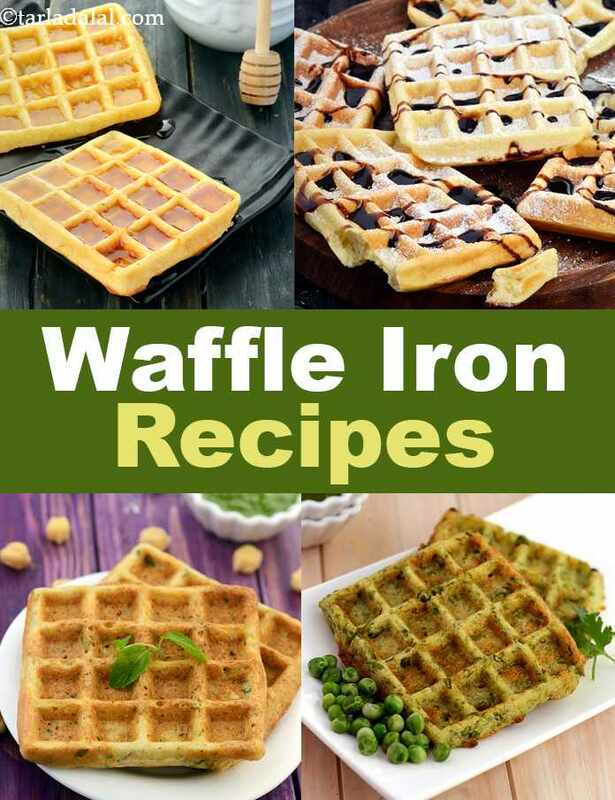 Enjoy our collection of 15 Waffle Iron recipes and other related equipement recipes articles below. Simple, healthy and presentable recipe for especially for christmas. Can also be served as a healthy option for morning breakfast and evening snack.